TAKE NOTE THIS IS FREE BEFORE 10:30, $4 AFTER. COME EARLY AND IT’S LIKE WE’RE BUYING YOU A DRINK. 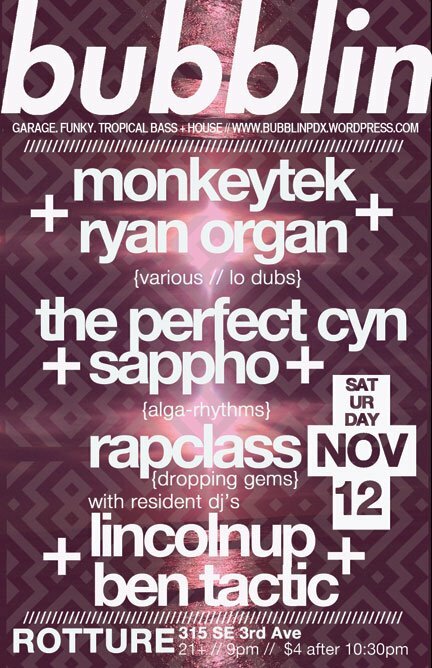 This entry was posted on October 26, 2011 at 3:26 pm and is filed under Ben Tactic, Bubblin, Lincolnup, Monkeytek, Ryan Organ, Showtime!. You can follow any responses to this entry through the RSS 2.0 feed. You can leave a response, or trackback from your own site.